We’d love your help. 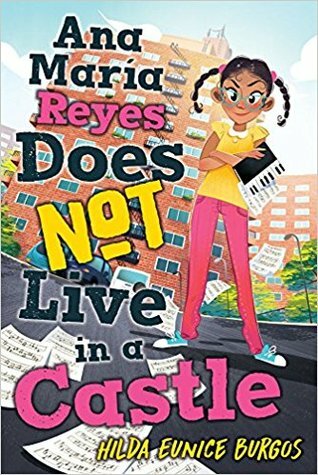 Let us know what’s wrong with this preview of Ana María Reyes Does Not Live in a Castle by Hilda Eunice Burgos. Her last name may mean "kings," but Ana Maria Reyes REALLY does not live in a castle. Rather, she's stuck in a tiny apartment with two parents (way too lovey-dovey), three sisters (way too dramatic), everyone's friends (way too often), and a piano (which she never gets to practice). And when her parents announce a new baby is coming, that means they'll have even less time Her last name may mean "kings," but Ana Maria Reyes REALLY does not live in a castle. Rather, she's stuck in a tiny apartment with two parents (way too lovey-dovey), three sisters (way too dramatic), everyone's friends (way too often), and a piano (which she never gets to practice). And when her parents announce a new baby is coming, that means they'll have even less time for Ana Maria. To ask other readers questions about Ana María Reyes Does Not Live in a Castle, please sign up. * "THE PENDERWICKS in Washington Heights"
* "The smart, guarded, hilarious narrator of MILLICENT MIN, GIRL GENIUS meets the piano practicer of A CROOKED KIND OF PERFECT"
* "A wonderful new diverse middle-grade debut, full of smarts and heart"
Ana is very smart and talented and it is assu Eleven year old Ana María lives in a two bedroom apartment in Washington Heights in upper Manhattan with her parents, older sister Gracie, 13, and younger sisters Rosie, 6, and Connie, 3. Ana's parents are from the Dominican Republic, and although their children have never been there, they are proud of their heritage. Her father, a graduate of Columbia Law School, is a public assistance lawyer, so the Reyes family needs to watch their money carefully. The characters were likable and believable. The story was good. Would recommend to a middle grader. This review has been hidden because it contains spoilers. To view it, click here. I read this aloud to my 12 year old and 8 year old girls and they loved it. This book kept them interested to the end. Hilda Eunice Burgos must write a sequel! My girls want to know if Anamay gets accepted to the Eleanor School. Situations in the book helped me have good discussions with my girls, such as, the scene where Mami slaps Anamay on the face at the beginning of the book. I let my girls know that in our state in the United States, slapping kids on the face is against the law. Legally in I read this aloud to my 12 year old and 8 year old girls and they loved it. This book kept them interested to the end. Hilda Eunice Burgos must write a sequel! My girls want to know if Anamay gets accepted to the Eleanor School. Situations in the book helped me have good discussions with my girls, such as, the scene where Mami slaps Anamay on the face at the beginning of the book. I let my girls know that in our state in the United States, slapping kids on the face is against the law. Legally in our state parents can spank with an open hand on the rear end, but hitting with an object such as a paddle, or hitting the face, is illegal where we live. The second situation in the book that made for good discussion was Tio Lalo's drinking. Tio Lalo, the uncle, drives drunk and nearly kills Anamay's sister. We discussed if forgiving Tio Lalo is really what most mothers would do. Personally, if a family member nearly killed one of my children by abusing drugs or alcohol, I would sever the relationship. Burgos also lightly touches on teen pregnancy when the older sister of one of Anamay's friends gets pregnant in high school. I discussed with my girls how the character in the book would struggle to finish high school and would probably not go to college. I discussed how some high schools have baby day care built in so that girls can bring their babies to school to graduate. My middle schooler was shocked at this. There's a lot of piano pieces mentioned in the book. We had fun looking up performances on YouTube and listening to the music that Anamay was supposed to be playing in the book. I'm not sure I find it believable that Anamay could play Meine Freuden at a performance level after practicing only an hour a day for a few months. Read this with my 9yo daughter. Cute characters, good family dynamics and loved the strong family values. I did feel like it was a little in-your-face preachy at times. While the messages were good, the lessons were clear enough without stating them and undermining the readers abilities. But the strong family, community and individual values are a win for me and glad to share with my daughter. I loved the character of Ana Maria. She is just so real. She is 13 and she can be quite mature and also very self centered as kids are at that age. Ana Maria's hard working, wonderful family is from the Dominican Republic and Ana Maria learns what is really important in life from them. Eleven-year-old Ana Maria Reyes is a very talented, determined girl. She has her sights on the prestigious Eleanor School in New York city and believes her piano performance will help her win a scholarship. But practicing is difficult with three sisters in a crowded New York City Washington Heights aprartment and then mom and dad announce they're expecting another baby. How will she ever practice now? She also has to figure out how to practice when her family goes to the Dominion Republic, paid f Eleven-year-old Ana Maria Reyes is a very talented, determined girl. She has her sights on the prestigious Eleanor School in New York city and believes her piano performance will help her win a scholarship. But practicing is difficult with three sisters in a crowded New York City Washington Heights aprartment and then mom and dad announce they're expecting another baby. How will she ever practice now? She also has to figure out how to practice when her family goes to the Dominion Republic, paid for by her favorite aunt, a doctor, who is getting married. While in the DR, Ana Maria discovers that her problems are small compared to some of the locals, particularly the young servant who works for her aunt. This awareness helps Ana Maria become more empathetic to the needs of others and learn who she really is. I’m trying to be more well-rounded and read different genres/age groups. This children’s chapter book was such a good start! Ana Maria; “Anamay” is the protagonist of this story and she is such a good example of how children can realize important life lessons without having an adult nag them all the time about life lessons. Anamay comes from a big family, and although she loves her family, she is often overwhelmed by the size and energy level of her family in their tiny home. Despite the chaos, I’m trying to be more well-rounded and read different genres/age groups. This children’s chapter book was such a good start! Ana Maria; “Anamay” is the protagonist of this story and she is such a good example of how children can realize important life lessons without having an adult nag them all the time about life lessons. Anamay comes from a big family, and although she loves her family, she is often overwhelmed by the size and energy level of her family in their tiny home. Despite the chaos, Anamay still manages to study and get excellent grades, while practicing and perfecting her piano skills as well. Her determination seems that it may pay off as Anamay has an opportunity to perform and win a scholarship to attend a prestigious school in the city. I’ll be honest and admit that I sometimes found Anamay to be a bit snobby, but her growth is apparent as she learns a lot about family, responsibilities, and life throughout the story. All of that growth is especially apparent with how she selflessly places others needs before her own and realizes that it’s often times more rewarding to help others. Even if her last name means "kings," Reyes lives in a crowded apartment with her siblings and loves #science and #piano. And then, a series of events including a #vacation to Dominican Republic, where she experiences the reality of life for some children who need to work, to help in the birthing of her sister! Her family comes together for her too, in many wonderful heartwarming ways! 3.5. Strong debut but it was really cluttered and Anamay was a tiny bit too much of a goody goody. I really enjoyed this heartwarming story of love, friendship and family. Thoroughly recommend. The major theme of this book is nice- the importance of family, but the character reads younger than her purported age. 5 stars. Enjoyable book about a close knit Dominican family told through the eyes of the second oldest daughter, Ana Maria. Ana Maria Reyes is a super smart, super talented girl who lives with her three sisters in Washington Heights in NYC. She hopes to win a scholarship to the prestigious Eleanor School. The book shares the ups and downs she experiences as she prepares for her piano recital that will determine if she will be admitted.